VBA and a heartfelt thank you – Wanna Be Mama B. 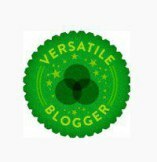 My fellow hopeful mama, Conceiving Baby, has honored me by naming me worthy of the Versatile Bloggers Award. Thank you so much! While I’ve been blogging for a long time, I’m new to writing about infertility and sharing this deeply personal topic. This is also an opportunity for me to say thank you to those that read my story and share your support. Knowing that there is a community of women online who are experiencing the ups and downs along with me en route to becoming a mama has been so important in alleviating some of the alienation infertility can cause. For those of you that I know personally, I also thank you for sending me your love and support after reading my posts. Writing has always been my creative outlet and I am so grateful to utilize it again as I ride this emotional roller coaster. 1. As I mentioned, I’ve always enjoyed writing and telling stories. When I was in second grade, each child in my class was required to write and illustrate a “book,” that was then bound by a teacher’s aide using cardboard and contact paper. While the assignment may have been to write one, I fell in love with the experience and created more than 10. 2. I wrote a novel. In 2009, I participated in National Novel Writing Month (NaNoWriMo) and completed my first full-length novel in one month. It was one of the most creatively demanding things I’ve ever done, and I was thrilled just to have finished. I’ve read it only once since I finished. Maybe someday I will even edit it! 3. When my husband and I first met, I knew we’d get married. 4. If/when I have a daughter, she will be named for my great-grandmother, who is the kindest person I’ve ever met. 5. My husband and I never went on a honeymoon. We wanted to visit Italy (he’s half Italian), but instead moved from New York City to North Carolina a few weeks after our wedding. 5b. Because of the move, we spent five of our first seven weeks as newlyweds more than 500 miles apart. 6. Most people would identify me with red/auburn hair, but I’ve also been blonde and brunette, and even had black hair briefly. I nominate the wonderful bloggers MamaCravings, Seeking Little C and Baby Momma Drama for VBAs. Thank you for sharing your infertility story with me and some many other hopeful mamas!